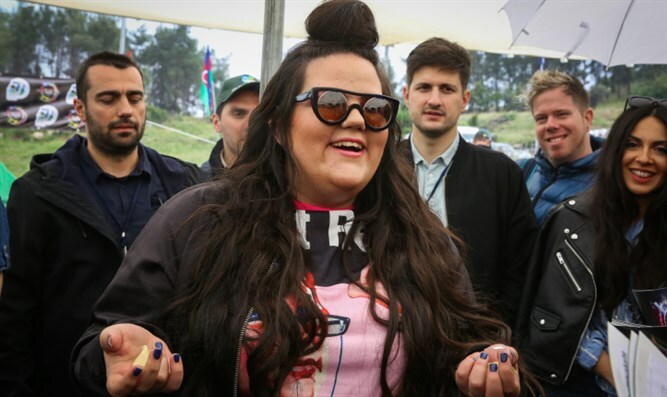 Netta Barzilai's "Toy" brings major competition back to Israel for first time since 1998. Israel's Netta Barzilai won the Eurovision final in Lisbon, Portugal, on Saturday night. "I'm so happy - thank you so much," said an emotional Barzilai when she took the stage after her win. "Thank you so much for choosing difference, thank you so much for accepting differences between us... I love my country, next time in Jerusalem!" President Reuven Rivlin spoke with Barzilai on Saturday shortly before she went on stage, telling her "from Jerusalem, from Nechama and I, we are sending you 'douze points'" - i.e. 12 points, the highest any country can be awarded. Regev uploaded a video of her and Barzilai to her Facebook page on Saturday night, writing "please God, next year in Jerusalem - we're crossing our fingers for you Netta!" Once the voting opened, even Prime Minister Binyamin Netanyahu gave Barzilai an endorsement on his Twitter account. And actress Gal Gadot posted an image of her on her Instagram feed, urging her followers to cast their votes for Israel.